Lois A. Cheney, professor emerita of BGSU, died on February 4, 2019 at the Bowling Green Care Center. She was born on May 2, 1931 in Cleveland, Ohio to Clark and Lillian (Burton) Cheney. Lois received her Bachelor’s Degree from Muskingum College, her Master’s Degree from Kent State University, and her Doctorate Degree from Michigan State University. 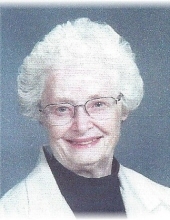 Lois was very active for many years with the First Presbyterian Church of Bowling Green where she served as a deacon and an Elder on the church Session. She also served as a Sunday school teacher for teens and adults locally and nationally. Lois’s other interests were writing, being an avid reader and enjoying her rescue cat, Shyloh. She is survived by her great-niece Melissa Schmid and great-nephews Richard Gerhardt, Ryland Steen and Drew Steen. She was preceded in death by her sister Carol Durham and niece Sandy Durham. Her funeral service will be held on Monday February 11, 2019 at 10:30 a.m. at Dunn Funeral Home, located in the Historical District of Bowling Green at 408 West Wooster St. Revs. Gary and Mary Jane Saunders will officiate. Interment will follow at Wood County Memory Gardens. Visitation will be held Monday morning at the funeral home from 10:00 a.m. until the time of her funeral service at 10:30 a.m.
Memorial contributions may be given in her memory to First Presbyterian Church, 126 S. Church St. Bowling Green, Ohio 43402. To send flowers or a remembrance gift to the family of Lois A. Cheney, please visit our Tribute Store. "Email Address" would like to share the life celebration of Lois A. Cheney. Click on the "link" to go to share a favorite memory or leave a condolence message for the family.